A while back, Nick wanted to reclaim his portion (note “portion,” never “half” muahaha) of the closet thus treated me to this homemade garment rack. The assembly is straightforward, but for the less handy, it’s definitely more of a several-hours project vs. “30 minutes” like some DIY tutorials claim! Staining the wood and spray-painting the pipes added extra time, but was well worth it in the end. I use this rack to rotate in favorite pieces or color schemes that I’m feeling at the moment. How to Store it All: Living in a small city condo, storage is something we just never have enough of. This is my favorite board – love browsing for closet inspiration and tips & tricks on how to put everything away tidily and most importantly, functionally. Left: nifty & informative graphic on how to style a midi skirt when petite. I try to demonstrate most of these tips in outfit posts but it’s always helpful to see this way! Right: in love with how elegant but simple this pairing is. Copying for sure! Hair & Beauty: From new nail polish to lip colors to try (I always like finding swatches on others online before buying), as well as hairstyle ideas and homemade beauty masks. Do it myself: projects & tutorials across all sorts of categories. Love a good Ikea hack! Nom nom: Nick and I both love to cook, and it’s been a fun challenge trying to cook healthier this year. One of my guilty pleasures was beef with broccoli from Chinese takeout joints, but it is so much yummier and healthier homemade (restaurant versions are usually super greasy!) that I can never go back. This crockpot version is just as easy as the recipe promises, and freezes well for quick weeknight dinners. I throw in lots of extra garlic and quickly blanch my broccoli instead of microwaving, since I like it crisp against the melt-in-your-mouth tender beef. This post is very inspiring and helpful!!!! I'd love to know how you store your SW lowlands? Are you using a boot shaper and if yes, which one? Thanks Jean! I like the infographic on how to wear a midi skirt when you're petite. I can relate! What would we do without Pinterest? haha. I love the garment rack and how it has shelves! Great picture. I love pinterest to find inspiration both for my personal life and for my blog. Yep, Pinterest is always the best for inspiration! Great style! I've been checking every day for the boohoo wrap to get restocked in smaller sizes :p Love your style, Jean! I love that rack. So much more fun than the premade ones. Yes, space is so needed for us all in the northeast USA! Thank you! I love your clothing rack! I LOVE your garment rack. Love!! Amazing post! Love your wardrobe! I looked at the DIY tutorial for the garment rack, and I like the colors of yours better. What spray paints and wood stain did you use? Love the garment rack! My boyfriend has made us a desk, shelves and wine racks with reclaimed wood and pipes/railroad ties so this is right up his alley. I may have to send him the pictures as a hint for what he can give me for my birthday…love the inspiration images too! So I realize you can't vet everything you post, but the girl in the camel coat? She has a quote from Anwar al-Awlaki on her Instagram. 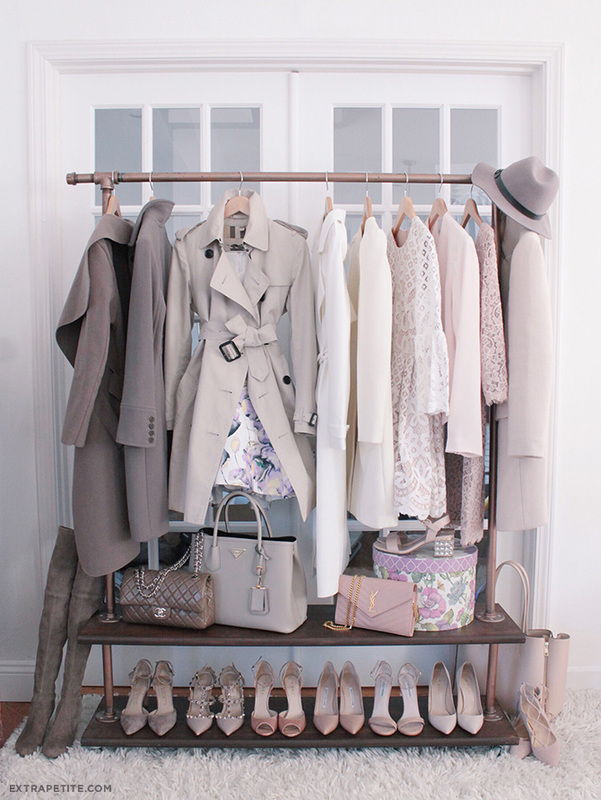 Such an amazing clothing rack! It would have been fun to see a video of the process! The colour palette on your garment rack is gorgeous! Awesome post! Lots of inspiration. Thank you for sharing. Those neutrals are to die for! what color is your ivanka trump flats? is it old rose?